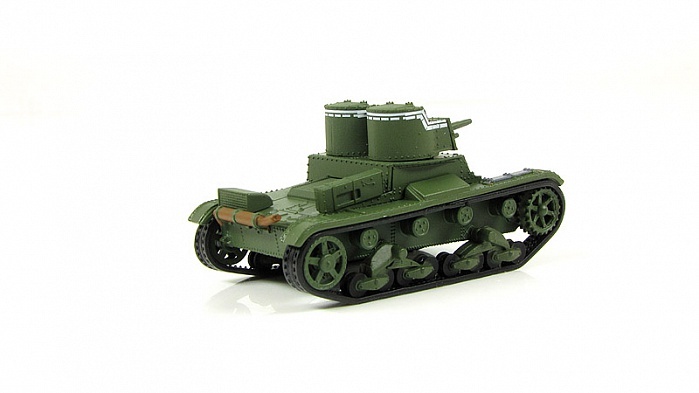 The T-26 tank was a Soviet light infantry tank used during many conflicts of the 1930s and in World War II. It was a development of the British Vickers 6-Ton tank and was one of the most successful tank designs of the 1930s until its light armour became vulnerable to newer anti-tank guns. It was produced in greater numbers than any other tank of the period, with more than 11,000 manufactured. 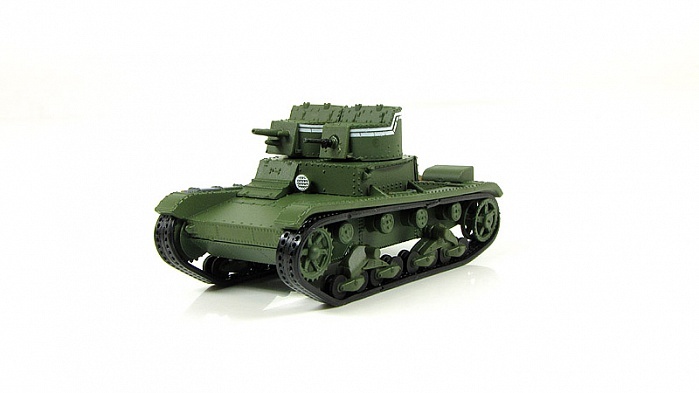 During the 1930s, the USSR developed 53 variants of the T-26, including flame-throwing tanks, combat engineer vehicles, remotely controlled tanks, self-propelled guns, artillery tractors, and armoured carriers. Twenty-three of these were series-produced, others were experimental models. 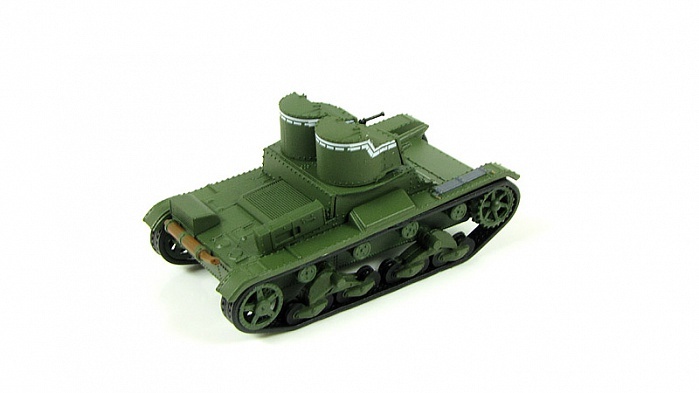 The T-26 together with the BT was the main tank of the Red Army's armoured forces during the interwar period. 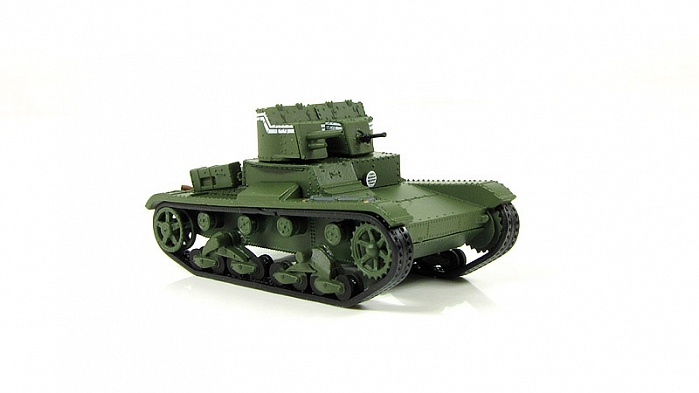 The T-26 was the most important tank of the Spanish Civil War and played a significant role during the Battle of Lake Khasan in 1938 as well as in the Winter War in 1939–40. Though nearly obsolete by the beginning of World War II, the T-26 was the most numerous tank in the Red Army's armoured force during the German invasion of the Soviet Union in June 1941. The T-26 fought the Germans and their allies during the Battle of Moscow in 1941–42, the Battle of Stalingrad and the Battle of the Caucasus in 1942–1943; some tank units of the Leningrad Front used their T-26s until 1944. Soviet T-26 light tanks last saw use in August 1945, during the defeat of the Japanese Kwantung Army in Manchuria. The T-26 was exported and used extensively by Spain, China and Turkey. Captured T-26s were used by the Finnish, German, Romanian and Hungarian armies. 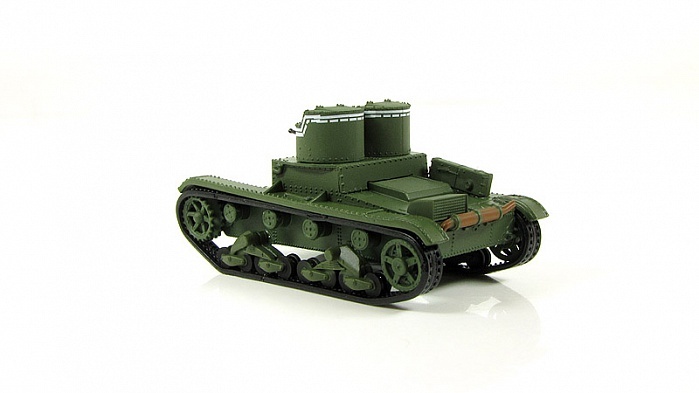 The tank was reliable and simple to maintain, and its design was continually modernised between 1931 and 1941. 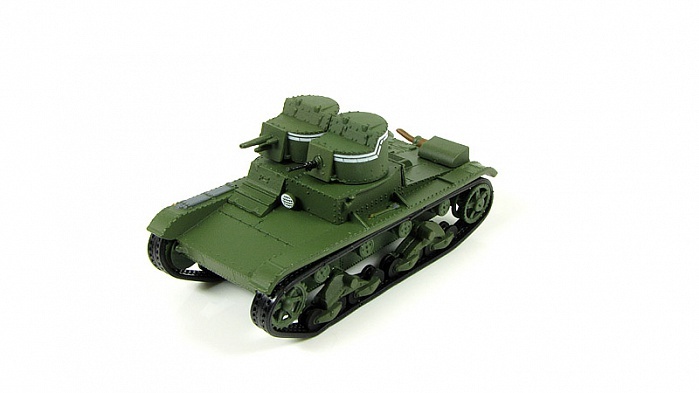 No new models of the T-26 were developed after 1940. T-26 model 1932 with gun plus machine gun armament: twin-turreted version with a 37 mm gun in the right turret. There were two models of 37 mm guns in the USSR suitable for mounting in light tanks at that time—the Hotchkiss gun (or its Soviet improved variant PS-1), and the more powerful PS-2 gun developed by P. Syachentov. The latter was superior, but only experimental models existed. Therefore, the first 10 pre-production T-26s, which had a design identical to the Vickers 6-Ton, were equipped with a Hotchkiss gun in the right turret to increase firepower compared to the machine gun armed Vickers tank. The experimental PS-2 gun was mounted on only three T-26 tanks, the right turrets of which were replaced with small gun turrets from the T-35-1 (prototype of the T-35 heavy tank). As the series production of the PS-2 gun was delayed, the Main Artillery Agency of the RKKA gave preference to a new gun. It was developed by the Artillery Design Office of the Bolshevik Factory, constructed from parts taken from the previously purchased German 37 mm anti-tank gun developed by Rheinmetall and the PS-2 gun. This system was successfully tested and the Artillery Factory No. 8 named after M. Kalinin started its series production under the designator B-3 (5K). The B-3 gun had less recoil and a smaller breech compared to the PS-2, so it could be easily mounted in the normal machine gun turret of the T-26. The first twin-turreted T-26 was armed with a B-3 gun in the right turret in late 1931. Unfortunately, series production of the B-3 gun proceeded slowly due to poor production standards (none of 225 guns produced in 1931 were accepted by army representatives; it took until 1933 to complete the original order for 300 guns placed in August 1931). Completed B-3 guns were mounted on BT-2 light tanks after mid-1932. This meant that twin-turreted T-26 tanks continued to be equipped with old 37 mm Hotchkiss (PS-1) guns. As production of the PS-1 gun had ended, some guns were taken from military supply depots and scrapped MS-1(T-18) tanks. The initial plan was to arm every fifth T-26 with the 37 mm gun in the right turret, but the final proportion was somewhat higher. About 450 twin-turreted T-26 mod. 1932 tanks mounting the 37 mm gun in the right turret were produced in 1931–1933 (including only 20–30 tanks with the B-3 gun). There were 392 T-26 mod. 1932 tanks with gun plus machine gun armament in the Red Army on 1 April 1933.